After an initial assessment, my boy was advised to start with Level A (Horizontal Addition and Subtraction). Of course, he found it easy because he's already an incoming 5th grader this school year. Since he only goes to the center twice a week, his teachers decided to give him two instead of just one take-home worksheet a day. This way, he'll be able to speed up and reach higher levels faster. 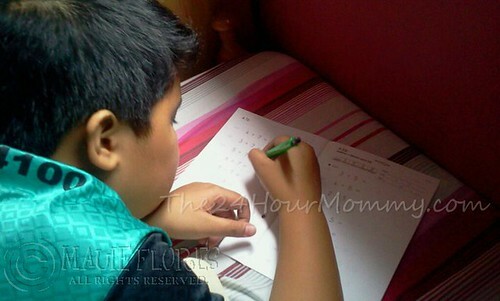 Now, after a two months, he's now doing Level C (Multiplication and Division). Division is kind of his waterloo and he requested his teachers to just give him one worksheet a day. I believe that the Kumon nethod is not for every child. It takes effort and discipline to be able to complete each take-home task. And because I'm a staunch promoter of individual learning style, I am not advising other parents to enroll their kids in Kumon not unless the kid wholeheartedly decides that it's the right learning method for him/her. There are so many ways in which a child can learn to develop his/her skills and Kumon is just one of them. The key is to find what works best for the child. Ever since, I found Rap to be an individual learner. Answering worksheets work perfectly for him and this is the reason why I make reviewers for him before each of his trimester exams in the first place. We did not enroll him in Kumon just so he'll be good in Math and that he'll have no problems getting an it degree like his dad. He's doing Kumon because he wants to. Rap will still continue with his Kumon worksheets even during the school year. I'm glad that his teacher agreed that he'll go to the center only once a week. He's aiming to be part of the honor roll and he told me that he'll need to be at least in Level I (Factorization, Square Roots, Quadratic Equation, Pythagorean Theorem) for that. I know my boy so well. He'll be able to do that, for sure. Hi, Judy! Thanks for reading my post. I actually meant "independent" when I wrote "individual." I believe that our individual learning styles spring from our unique personalities. Since Rap is an only child, he is used to doing things by himself. He's actually shy to socialize and interact with other people. In school, he works best with individual projects and tasks. I guess, you just have to observe your child and take note of what works best for him. I'd like to share another Math learning method which is not exactly like Kumon. For those moms and kids who aren't really fond of answering worksheets. 'Cause like you said, each child has his/her own learning style and our 4th grader will feel like she's being punished if we made her answer worksheets as in Kumon. Hehehe. We are into the A.L.O.H.A. Math Learning Program which stands for Alternative Learning on Higher Arithmetic. With ALOHA, we learn with the abacus first and integrate higher arithmetic with it. This helps us "visualize what we're computing" - and that pretty much works for me (from the time I started ALOHA until now) and also for our 4th grader. My sister loves ALOHA, how it's being taught, and their learning environment. ALOHA has been part of my childhood Math memories. Haha. I studied at what is now St. Anthony of Padua C-something A-something M-something (SAPCAM) in Otis, Manila. Thanks for sharing about A.L.O.H.A. I've heard good things about the method. Actually, it's one of our choices. However, I didn't find one that is near our area. Kumon Learning Method is incredible and it is very useful like ALOHA. Thanks for sharing about A.L.O.H.A. i appreciate you for this.